The last social business use case I'm going to share in this blog post is reputation management – something that is particularly important to financial services institutions. Financial institutions build their businesses on trusted reputations that have been carefully managed over many years. However, in the digital era, the public airing of complaints, grievances or past customer experiences can deliver an immediate, measurable and sustained impact to other prospects and customers' decision making. It's important to acknowledge that what others say about you is more influential to new customers than what you say about yourself. This is why social media trumps advertising. Banks, insurance companies, wealth management advisors and other financial services firms who disappoint consumers are increasingly being called out in public forums and social networks that reach thousands or millions of potential or existing customers and have a duration of months or years. In fact, online comments may never really go away. These remarks and conversations may eventually subside, but the information gets rediscovered indefinitely. If a financial institution is chastised by existing customers, new prospects will steer elsewhere and existing customers will take note, thereby increasing their likelihood of churn. Remember Bank Transfer Day? This was a social media movement started by one consumer who got upset at a $5.00 monthly debit card fee by Bank of America. Ultimately, Bank of America nixed the fee, but not before an estimated 220,000 people moved their accounts elsewhere. Or in another case reported by CNNMoney, a BofA customer upset with an interest rate allegedly "jacked up" by 30 percent created a YouTube video rant. BofA later reduced the interest rate, but not before the story was picked up by a slew of news media. Interestingly, the rant still comes up as a top search result when searching for a new bank. Ouch. Many times reputation damage stems from non-digital sources but then escalates in the social sphere. For example, when local regulators probed Wells Fargo for an overly aggressive cross selling culture, the spill over into social media triggered additional state and local investigations, lawsuits, nervous customers and damage to reputation. Because Wells Fargo failed to adequately respond to the social incite, the story line spiraled based on (exaggerated and arguably inaccurate) social inflammation. Reputation management is aimed at discovering and responding to consumers who publicly post both valid experiences and misinformation. It's a big change from the typical ignorance is bliss strategy or practice of believing if you ignore it, it will somehow go away. It doesn't go away. In fact, it often gets propagated thereby giving it exponential reach and staying power. 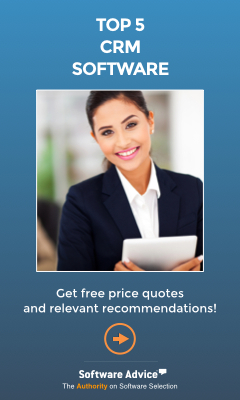 Reputation management activities include social monitoring, alert notifications, customer sentiment measurement and trending, communication and response protocols, and early crisis management intervention. For many FSIs, reputation management is a part of Risk Management or a Customer Experience initiative. Critical success factors include early detection and response, candid and transparent communication, public customer feedback channels and an overall etiquette aimed at fixing the problem, and not coming across as defensive. Two final notes of caution. First, don't kid yourself that your customers are different, and do not consider the public comments, opinions and experiences of other customers when evaluating your financial services organization. Second, don't fall into the all too common trap of trying to game the system. 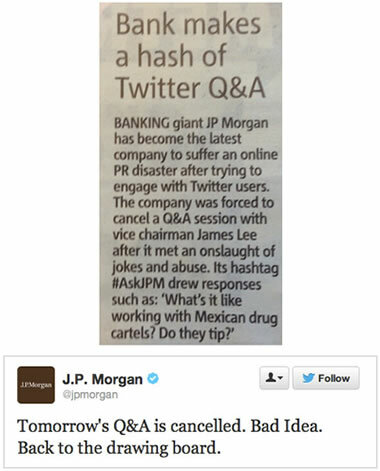 Many FSIs before you have suffered this fate, as illustrated in the below newspaper clipping and twitter post. It's important to acknowledge that what others say about you is more influential to new customers than what you say about yourself. This is why social media trumps advertising.